The Management Ethics Committee, chaired by the president, meets twice a year, in principle during March and October, to formulate Company-wide policy and confirm and discuss matters, such as the handling of inquiries and consultation by the consultation desks and the results of the monitoring of compliance awareness among employees. We have also established Compliance Committees in each unit to consistently and proactively engage in initiatives for promoting compliance. Over 300 management-level personnel have been appointed as compliance managers and compliance promoters at each workplace to lead in promoting concrete compliance activities. To further stimulate action on compliance, information is shared through channels such as the Compliance Promoter Liaison Committee (convened in January in fiscal 2017, with 280 participants). Tokyo Gas has set up consultation desks internally through its Compliance Department and externally through a law firm and communication support center. All individuals working at the Tokyo Gas Group, including officers, regular and temporary staff members as well as the employees of our suppliers can directly contact these desks by phone or email whenever they feel uncomfortable raising a matter within their organization. The Compliance Department also handles consultation for our suppliers. These consultation systems for employees and suppliers serve as internal points of contact, as stipulated in the Whistleblower Protection Act. Under the operational guidelines of the consultation desks, advice and solutions are provided to employees who make inquiries or request consultation. The requests are treated in strict confidence, and the employees are protected against any discriminatory treatment for using the desks. In fiscal 2017, 104 employees used the service for various consultations, including interpersonal relationships in the workplace and other employment matters. Independent advisory services have also been established at all subsidiaries and Tokyo Gas LIFEVAL (“LIFEVAL”) companies. In November 2017, training sessions were held for the personnel staffing the consultation desks at subsidiaries and LIFEVAL companies to strengthen their ability to handle inquiries and consultations. These desks play an effective role in enabling the Company to discover and resolve problems at an early stage so that the Company’s self-regulating processes function effectively. Tokyo Gas, our subsidiaries and LIFEVAL companies organize a range of activities to encourage employees to apply Tokyo Gas Group Our Code of Conduct to their own situations. 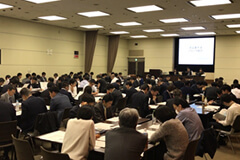 Workshops led by compliance promoters are held at the level of individual workplaces at Tokyo Gas, our subsidiaries and LIFEVAL companies (28,726 employees participated in fiscal 2017). These workshops feature awareness-raising resources entitled “The Case Method,” “Collected Cases of Compliance,” and “Learning from Cases! Collected Statutes.” Developed in light of Tokyo Gas Group Our Code of Conduct, the resources are used to improve participant understanding of the laws, ordinances and regulations governing the practice of Our Code of Conduct and to help them apply the code in practice. Level-specific training for new employees and others is provided with the active participation of subsidiaries and LIFEVAL employees to foster a compliance mindset (1,527 employees underwent training in fiscal 2017). The Compliance Department also conducts customized onsite training to meet the needs of each department and company and generate synergies through their own independent activities (614 employees took part in a total of 27 training sessions in fiscal 2017). 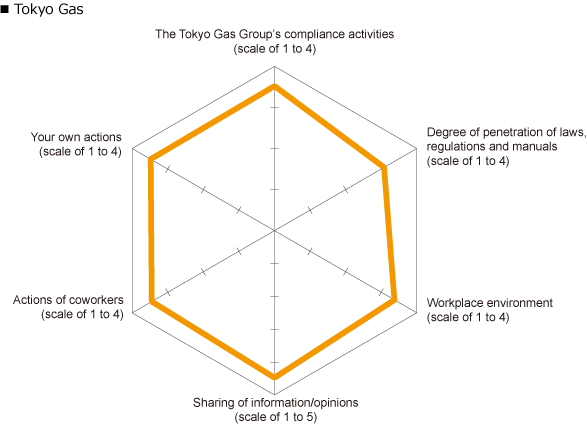 Training is provided annually to the Tokyo Gas Group employees to improve understanding of legal compliance. In fiscal 2017, around 600 Group employees took part in 9 training sessions on the Antimonopoly Act, the Act against Unjustifiable Premiums and Misleading Representations, and the Subcontract Proceeds Act. During the sessions, concrete instances of legal violations released by the Fair Trade Commission and Consumer Agency*were explained as practical case studies. *Case studies include examples of cartels and abuses of superior bargaining position (Antimonopoly Act), and misleading representation (Act against Unjustifiable Premiums and Misleading Representations). 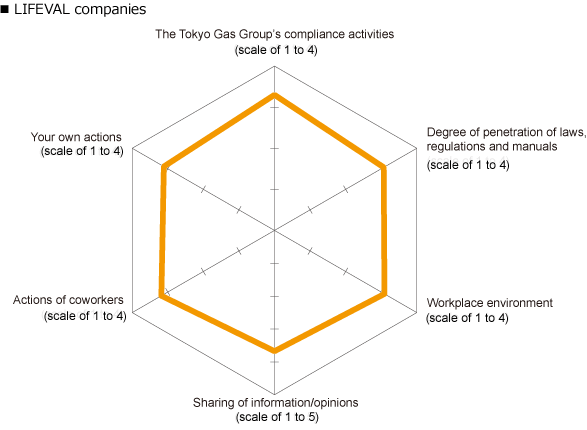 We are working to raise the standard of compliance by widely publicizing across the Tokyo Gas Group up-to-date information on the compliance risks associated with changes in the Group’s business environment, including those associated with our evolution as a total energy business, acceleration of our global business development, and the revision and stricter enforcement of prevailing legislation. One way in which we share this information is by publishing the bimonthly newsletter “Compliance Information” as a resource for compliance managers and promoters who lead activities at the Company, subsidiaries, LIFEVAL companies and some partner companies. In fiscal 2017, information on changes in public expectations was quickly shared, including information on compliance check points for the revised Act on the Protection of Personal Information and information on the revised Consumer Contract Act enforced in June 2017. 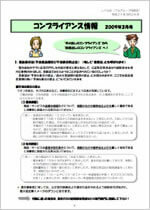 These newsletters are also used in workplace workshops to share information on cases within and outside the Company. 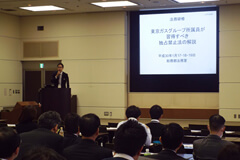 Tokyo Gas promotes compliance by LIFEVAL and other partner companies, which provide regional services on behalf of Tokyo Gas. We conduct onsite training and provide educational tools tailored to the current status of each company and assist in encouraging the adoption of PDCA cycles. 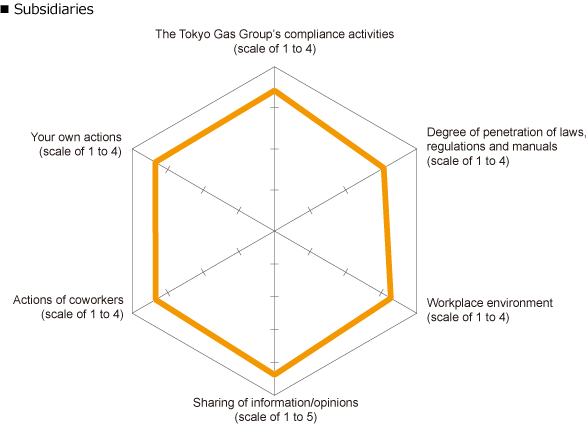 As part of our compliance promotion activities, we distribute copies of Tokyo Gas Group Our Code of Conduct and booklets on subjects, such as the protection of personal information, and hold lectures for management-level personnel. Since fiscal 2010, we have exchanged opinions on compliance with some partner companies, and we share news on compliance and information on compliance measures to raise awareness. Copies of Our Code of Conduct are also distributed by the Tokyo Gas Merchandisers Organization (“TOMOS”) to all employees of its members to ensure that the code takes root and that business is conducted in accordance with the values and principles espoused by Tokyo Gas. The Tokyo Gas Group is fully committed to preventing bribery and corruption in all domestic and international transactions by complying with the anti-bribery and corruption laws in each country and region and specifying in Tokyo Gas Group Our Code of Conduct our obligations to comply with laws and be fair and honest with our customers and suppliers. In line with the expansion in our overseas business in accordance with the goals set forth in GPS2020, we have established the Basic Policy On Overseas Business Promotion, which pledges to carry out equitable and transparent corporate activities in international communities. In particular, bribery and corruption not only damages social credibility but can also hamper economic growth in developing countries. We have thus formulated the Foreign Public Official Anti-Bribery and Corruption Guidelines to outline specific actions we must take. Bribery and corruption of foreign public officials and other individuals and spending on facilitation payments to foreign public officials and other individuals are prohibited. The provision of inappropriate hospitality, gifts, donations, and the like is prohibited. All hospitality, gifts, donations, and the like made to foreign public officials and other individuals and appointments of certain third parties must first be approved through the procedure described in the guidelines and must be accurately accounted for in a timely manner. To prevent the bribery and corruption of agents, consultants, and similar third parties, due diligence must be performed before they are appointed, clauses prohibiting bribery and corruption must be incorporated into their contracts, and other appropriate measures must be completed. The same applies to M&As with foreign firms. Prohibition of inappropriate hospitality, gifts, invitations, overseas donations, etc. Relationships with partners of joint ventures, etc. The chief compliance officer acts as the executive officer with chief responsibility for preventing overseas bribery and corruption. Supervisors responsible for implementing measures to prevent bribery and corruption overseas are appointed in every department and company of the Group that is subject to the guidelines to take responsibility for the approval of hospitality, gifts, donations, and the like, confirmation of the findings of due diligence when appointing third parties, approval of entry into contracts, and other matters. The Compliance Department decides on specific measures for implementing the guidelines. 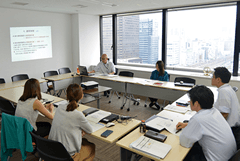 The Tokyo Gas Group provides training to employees primarily involved in business overseas to ensure proper compliance with the guidelines. In fiscal 2017, 344 personnel received this training. We have produced an English version of the guidelines for locally hired employees and have distributed the English edition of Tokyo Gas Group Our Code of Conduct to ensure that everyone understands its content. We have also established a system to enable Group employees working overseas to report and seek advice. We implement PDCA cycles to ensure that bribery and corruption are being prevented by monitoring the situation through internal audits and other means to confirm that the procedures established by the guidelines are being followed. We regularly conduct surveys of all employees, including officers, regular and temporary employees at the Company and subsidiaries, to monitor the effectiveness of compliance promotion activities. In fiscal 2017, we made the contents of our survey more specific by increasing the number of survey items related to reporting, contact and consultations in the event of problems. In addition to all employees of the Company and subsidiaries, we distributed the survey to those at Tokyo Gas LIFEVAL (“LIFEVAL”) companies to which we outsource various tasks. As the following figures show, Tokyo Gas, its subsidiaries and LIFEVAL companies have maintained high average scores of over 3 out of a maximum of 4 in every category. As a reference for future improvement, general feedback on the survey results and corresponding actions to be taken was provided by the Compliance Promoter Liaison Committee in January 2018 and individual feedback on survey results was provided to each company between February and March of the same year. These survey results are posted on the intranet for review by all employees of Tokyo Gas, our subsidiaries and LIFEVAL companies. 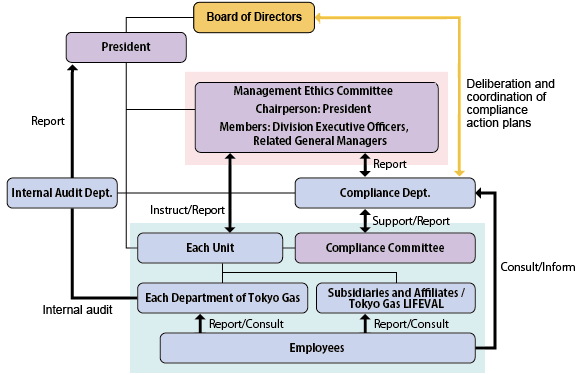 The Internal Audit Department regularly conducts audits of Tokyo Gas and its subsidiaries and affiliates focusing on the severity of risks and the probability of their materialization from the perspective of legislation related to the audited unit’s operations, as well as corporate ethics and social norms.